I remember hearing several months ago from a LEGO store employee that LEGO had gained the Scooby rights. Few months later, sets are announced. That's something, although I agree that we can't rely on everything they say. 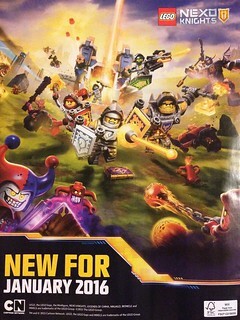 rogue27 wrote: The rumor seems fairly reasonable based on how LEGO tends to design their themes lately. Humans versus monsters. Space Police III, Alien Conquest, Galaxy Squad, Monster Fighters, Atlantis, etc. It's like they don't trust children to use their imagination anymore; the bad guys have to be obvious now. I guess Trolls make sense for that. Who's to say the orcs/trolls have to be the bad guys? The LEGO marketing team. Every Castle theme in the past 15+ years has had one faction that was clearly the bad guys. Aggressive facial expressions, scars, eyepatches, and set designs depicting them as kidnappers, robbers, or aggressors. This puts a child's thoughts into a box as opposed to giving them an open slate like in the 70s and 80s. A little bit of familiarity with human behaviour (and/or a little imagination) and all of a sudden there's two sides with conflicting, but overall grey moral codes. I get that. I'd like to think that most adults get that. However, the mainstream news tends to tell the same good versus evil story as modern children's toys, so I fear that a lot of people's minds never leave that box I mentioned above. TLG is afraid to challenge children's imaginations because they are competing against a plethora of toys that do not, and consumers tend to follow the path of least resistance. Maybe I'm just odd, the 'worse' Lego (or whoever) tries to make a faction the more I treat them as 'not as bad as their enemies claim them to be'. In this context 'their enemies' includes the Lego marketing team. Lego has always challenged kids imaginations, even if they choose to not challenge them as hard I get the notion kids will keep doing it themselves because that's what kids do. A kid can only combine the 'good factions' to beat on the 'bad factions' so many times before deciding one king has gotten himself into a conflict with another within his own faction, and then their whole Lego realm goes from LotR child's play into Game of Thrones grimdarkness. How about a Heroica themed castle line? Gives the kiddies characters to identify with and offers AFOLs civilian set options along with military and action set options (at least if they made use of all the map locations) and they could expand the map and sets after the initial line of sets. This also offers TV cartoon and other monetized options for profitability (like Ninjago or Chima). Indeed, I was always a little surprised they never did more with Heroica. Perhaps it was a timing issue - it was originally released while Kingdoms was around, and Lord of the Rings was just around the corner. I also wonder if they had an idea that they wanted to keep the Lego Games properties distinct from the "regular" sets. However, I can't help but feel that the Prince has an element of similarity to the blue Lion Knights from the 2013 Castle sets. Not a big fantasy era fan myself. Just never really did it for me. As has already been mentioned - the human vs human, conflict neutral way is my preferred. That way it is all down totally to the kid/AFOl to decide the goodness/evilness of the factions. We will just have to wait a few more months until something official comes up. Edited to remove leaked images. Please review the TOS about what is okay to show and not okay to show. Thank you. Guys...those pictures have the "Confidential" mark on them...which means they are not okay to share here at Classic Castle. I have edited your post to remove them. Please do not repost these. I found an image of the characters in question that wasn't labeled confidential, but it also looked like it was edited. I think the best thing to do is to wait for the official announcement from Lego before posting anything specific. Related topic: I think the thing I miss most about previous Castle themes is the fact that they weren't built around specific characters. I don't mind the "lets make the villains obvious" thing; I mind the way we're not allowed to make up stories about our own characters now. Sure, we can build stuff and mix-and-match and create factions and such. I just miss the years when Castle sets were, even when you followed the instructions exactly, a mound of possibilities that didn't make you feel like you were subtracting anything from the original when you added your own customized figs. Customizing was all about building on to what was there before, and using the off-the-shelf kits as launching pads for the imagination. Brickset posted this image today. Looks like just a Castle goes to Space but still uses swords. At least some of the armor could be interesting to work with. It's an interesting take on Castle just based on the poster. I have to admit, I'm excited to see more. The shields certainly look hopeful with potential uses and the evil Jester and random alien dude look pretty good. Naturally it's hard to judge based solely off of the advertisement poster for the CN show, but it's leaps and bounds better than I had originally thought the first look would be. Here's hoping for the best once we see some set pics! I see nothing there for me. Maybe some good new visors. If this theme turns out to be like Chima, (most people are saying) I doubt we will get a "normal" castle theme for a long time due to the fact that the themes would both conflict each other. Leo of Rothenburg wrote: If this theme turns out to be like Chima, (most people are saying) I doubt we will get a "normal" castle theme for a long time due to the fact that the themes would both conflict each other. I think that's almost a certain. Unless TLG pick up a licence for a fantasy/castle film that has yet to be released and doesn't have too much overlap. It looks like there could be some fun new pieces, namely armour, visors, shields and those axe blades. Remains to be seen that the figs look like in the brick. I'd be tempted by some sort of minifig battle pack, if they follow the Chima idea, but looks unlikely that any of the vehicles shown will interest me.